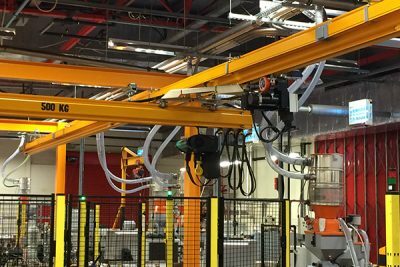 Our fabrication and machine shops not only allow Hoist UK to provide bespoke, safe solutions to our client’s material handling and lifting projects but also allow a responsive solution for prototyping and small batch manufacturing for our trade and end user clientele. Both the fabrication and machine shops operate under our strict supervision and are regularly audited to make sure they comply with our OSHAS18001, ISO14001 and ISO9001 and production is coordinated through the sales and design offices to provide quality components and products within budget and on time. We pride ourselves on our innovative approach to solution provision, and our set up allows us to provide material handling and lifting solutions to the most unusual or seemingly awkward applications. If a proprietary product is not available for your project we will design and manufacture a bespoke solution that will be technically correct and meet your exact requirements. Our high performance manufacturing arm is supported by our multi-skilled team of engineers who each specialise in a different area of our operation. Within our workshop we have coded welders for MIG and TIG Welding working with both steel and aluminium fabrication, as well as machinists working with our CNC Lathe and Milling machines, and Plasma Cutter. We invest heavily in our machinery and engineering team so that we are equipped to deliver the very best manufacturing service for our customers. Through persistent reinvestment and training we continue to develop the breadth of our manufacturing operation's offering so that we can continue to not only meet but exceed our customers expectations and maintain our strong position as a full service provider for our entertainment and industrial customers in the lifting and handling equipment market sectors.